Lower Plenty formed out of Melbourne, Australia and the four-piece gently bobbing away in the shadows letting their psychedelic native peers Tame Impala take all the plaudits before finally reaching these shores in a gentle-prodding manner rather than riding on the back of big-money promotion and heavy rotating airplay. 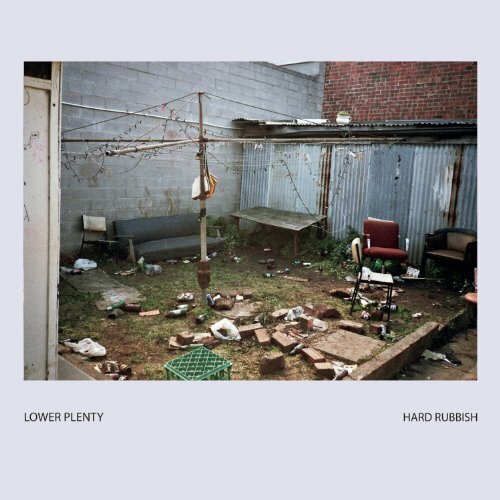 Their debut album, Hard Rubbish, has a desolate picture on its front cover. Bricks, bits of wood, broken chairs and a decrepit washing-line lie strewn in what looks like a bomb blasted back garden. It instantly reflects the mood of this bleak and downbeat affair. LP were created following the dissolution of the band members' former respective bands and, without being party to those outfits, I haven't a clue how they measure up in terms of sound or vision. However, I am viewing this as a good thing as it prevents any preconceived ideas and shouldn't detract from reviewing Hard Rubbish on its own merits. Relying on minimal instruments, they set up with two guitars, drums and mechanical percussion, and take lo-fi to a whole new level of insecurity and numbing nihilism. Recorded on an eight-track reel-to-reel, the rawness of their approach shows through on such melancholy gloom-fests as 'Nullarbor', with its stripped-back, atonal vocal, but a surprisingly uplifting slice of country brought via the mellifluous, chiming guitar picks. The stark arrangement is inexorable, from the opening bars of 'Work in the Morning' right through to the acoustic strands of 'Close Enough', but you won't need to reach for the tourniquet, as their idiosyncratic brand of short, sharp jabs of pain (the nine tracks on show add up to under 25 minutes) capture a band scattered with miserable heartbreak while delivering their pain effortlessly. One for the bookish night-owls who wallow in their own self-pity? Yeah maybe, but Lower Plenty seem destined for bigger things rather than just satisfying gloomy bedwetters.